Canon Black Friday in July Sale: $80 Off on Refurbished 70D, T6s, T6i, T5 ! ">Canon Black Friday in July Sale: $80 Off on Refurbished 70D, T6s, T6i, T5 ! Hot: Get 20% Off When Buy Canon 80D, T6, T5 Kits Use Amazon Rewards Visa Card ! ">Hot: Get 20% Off When Buy Canon 80D, T6, T5 Kits Use Amazon Rewards Visa Card ! Amazon.com currently has a limited time offer when buying Canon EOS 80D w/ 18-135mm lens kit, or Canon Rebel T6 w/ 18-55mm lens kit, or Canon Rebel T5 w/ 18-55mm lens kit. You can get 20% off when use Amazon.com Rewards Visa Card. Hot Deal – Refurbished Rebel T5 w/ 18-55mm IS & 75-300mm Lenses for $249 at Canon Store ! ">Hot Deal – Refurbished Rebel T5 w/ 18-55mm IS & 75-300mm Lenses for $249 at Canon Store ! Canon USA direct store has a hot refurbished deal for Canon EOS Rebel T5 kit back. This is lowest price for this kits, same as Black Friday price. Refurbished Restocked: 5D Mark III for $1,899, 70D w/ 18-55 for $649 and More ! ">Refurbished Restocked: 5D Mark III for $1,899, 70D w/ 18-55 for $649 and More ! Canon USA direct store has restocked several refurbished DSLR cameras and lenses today, such as 5D Mark III for $1,899, T5 w/ 18-55mm lens for $199 and more. Canon Store Cyber Monday 2: Refurbished Rebel T5 w/ 18-55 for $209 and More ! 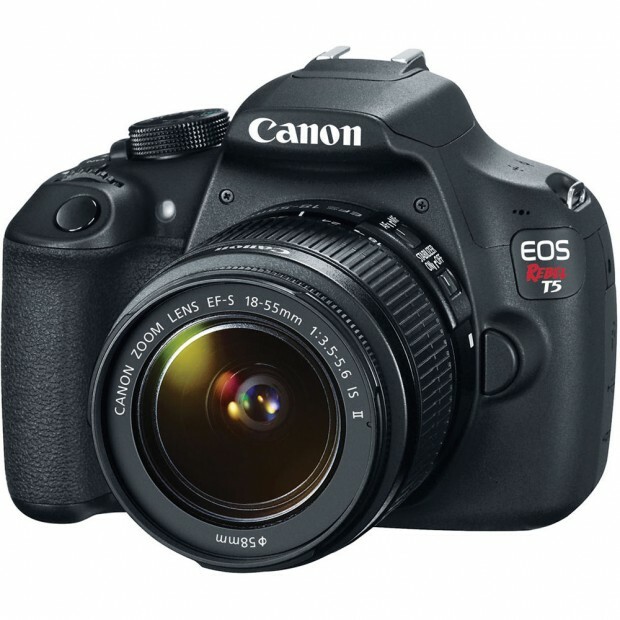 ">Canon Store Cyber Monday 2: Refurbished Rebel T5 w/ 18-55 for $209 and More ! Canon USA direct store has released the second Cyber Monday deals in November, including several great deals on EOS DSLR cameras, Speedlight Flashes, and printers. Canon Rebel T5 w/ 18-55mm & 75-300mm Lenses + PRO-10 Printer + More for $449 ! 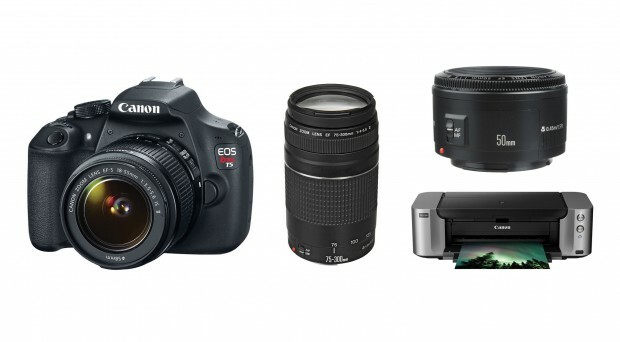 ">Canon Rebel T5 w/ 18-55mm & 75-300mm Lenses + PRO-10 Printer + More for $449 ! 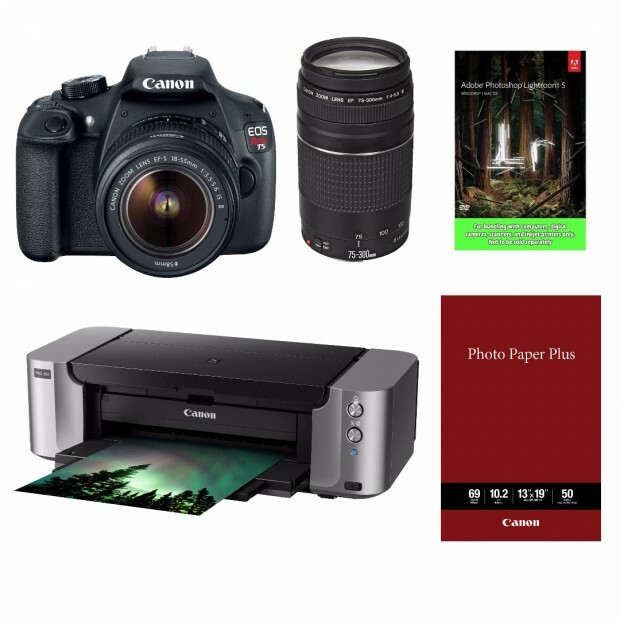 Canon USA authorized dealer Focus Camera has a great deal on Canon EOS Rebel T5 and printer bundle. Hot – 10% Off on all Refurbished Canon Cameras, Lenses at Canon Direct Store ! ">Hot – 10% Off on all Refurbished Canon Cameras, Lenses at Canon Direct Store ! Canon USA direct store has started a new sale on refurbished DSLR cameras, PowerShot Cameras, Lenses. You can save 10% instantly when enter promo code “QQCC15” at checkout. Hot Deal – Refurbished Canon Rebel T5 w/ 18-55mm Lens for $299 ! ">Hot Deal – Refurbished Canon Rebel T5 w/ 18-55mm Lens for $299 ! Canon USA Direct Store has a great deal on refurbished Canon Rebel T5. Hot Deal – Canon T5 w/ 18-55, 75-300, 50 f/1.8 II Lenses + Pro-100 Printer & More for $449 ! ">Hot Deal – Canon T5 w/ 18-55, 75-300, 50 f/1.8 II Lenses + Pro-100 Printer & More for $449 ! Adorama has a great deal on Canon EOS Rebel T5. Hot Deal – Canon T5 + 18-55 + 75-300 + Pro-100 Printer + LR5 for $399 ! ">Hot Deal – Canon T5 + 18-55 + 75-300 + Pro-100 Printer + LR5 for $399 ! Canon USA authorized dealer Focus Camera has a great deal on Canon EOS Rebel T5 DSLR camera.